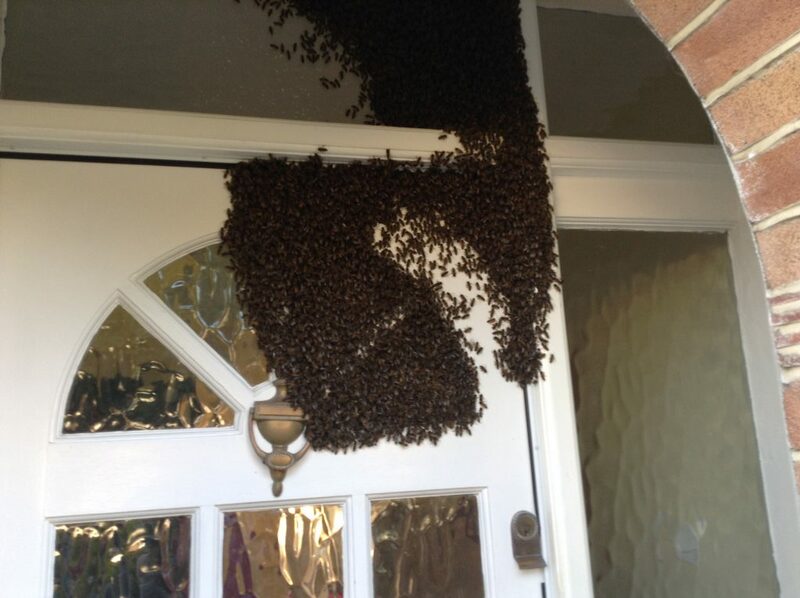 Pest control officers came to the rescue of a swarm of honey bees which had completely covered the front door of a property in South Gloucestershire. At this time of year, bees start swarming, especially during periods of warmer weather, as one Downend resident discovered. Catherine Young, from Downend in South Gloucestershire, who works in the council’s private sector housing team, received a call from her a neighbour who alerted her to a problem with her house. The neighbour explained that thousands of bees or wasps were covering part of Catherine’s front door. Unsure what to do next, she contacted the environmental protection department for advice. She spoke to the pest control team who work with local residents and businesses, and an officer arranged a home visit. The swarm contained thousands of honey bees and due to their location she was unable to enter her house through the front door. The pest control team worked with a local bee keeper, firstly to identify, and then remove the swarm of honey bees which are now settling in to a new hive in Cromhall. Catherine said: “The experience was rather bee-wildering and I wouldn’t have known what to do or who to call if I didn’t work for the council. The pest control team provided a great service, responded really quickly and were very friendly and helpful. Environmental Health Manager Gerard Madden said: “We’ve received several calls in the last few weeks as bees are swarming at the moment. Bee keepers are only interested in taking away honey bees, so residents often require a professional to help them confirm the specific type of bee. “As well as dealing with bees, wasps are starting to cause problems for local people at this time of year and we are seeing requests for treating them go up year on year with 350 requests in 2013, 483 in 2014 and 560 in 2015. Our pest control services are available throughout the week and once a request for service has been received, the pest control team will make contact to arrange an appointment at a time and date convenient for you. We have a clear pricing structure, with some concessions for people in receipt of certain benefits. For more information visit www.southglos.gov.uk/pestcontrol or telephone 01454 868001.